One morning in mid-March, because I was running late for a meeting, I opted to ride across Waterloo Bridge, expecting it to be the fastest route, despite its being a hostile environment for cyclists. Only just over half way across, however, I found myself stuck behind a queue of buses stretching all the way to the Strand. Resting my foot on the kerb, I peered down the long, red, double-deck wall, wondering what I should do. As I did so, a passing pedestrian decided to lecture me on the basis of what he thought I was doing, not my actual actions. I tried shouting after him to explain I had not the slightest intention of riding my bike down the pavement, as he assumed I planned to do. But he was already off, an air of self-righteousness buzzing around him like flies round a smelly cow. It was one of several times recently when I’ve come across people making judgements about people’s behaviour on the roads based on their perceptions of what was happening, rather than the reality. I’ve had to pull out of my son’s front tyre a tack that had been left, presumably deliberately, on a cycle path to thwart someone’s idea of bad, irresponsible cyclists. I’ve rowed with an Uber driver who thought I was being unreasonable by riding down the middle of a narrow street to stop him from dangerously overtaking me and my family. I’ve seen pedestrians pause as I slowed to a stop at traffic lights, apparently assuming I would breeze on through. These and other incidents have all made me realise how hard it is to change attitudes about events on the road. 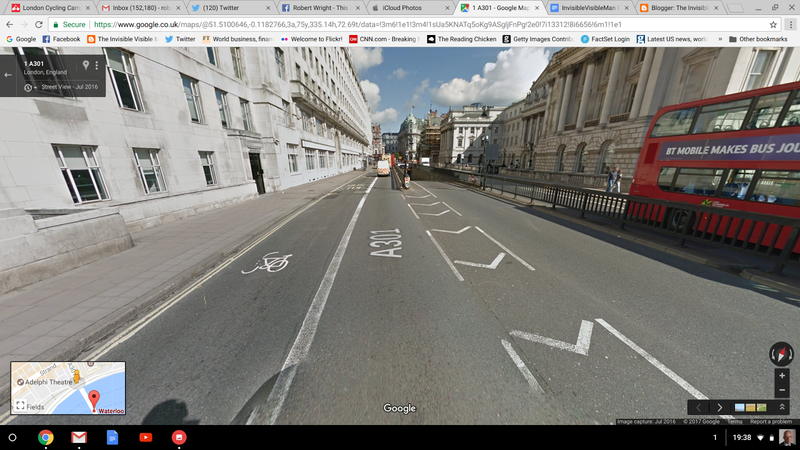 As far as the angry man on Waterloo Bridge is concerned, he went away having prevented a cyclist from riding on the pavement, an event that can only have reinforced his self-righteousness. The people who scattered the tacks on the cycle track will have assumed they thwarted some lycra-clad cycle commuter and won’t have seen my son’s anxiety over the incident. The Uber driver gained no understanding of why I was riding in the middle of the road so will only think cyclists more unreasonable. The wary pedestrians will assume I’m the exception, not the rule. But the incidents have also made me think about how I react when I’m out on the streets myself. Time and again, as I assess the risks of some situation, I look round to work out how much of a danger a particular driver’s behaviour is likely to represent. I notice that I retreat into the basest assumptions about how people of a particular race or gender will behave or judge a person solely on his or her choice of car. The recognition has impressed on me yet again the vital importance of getting to know the widest possible range of people and understanding their views. Yet both on the roads and in politics - which it’s now my day job to cover - groups appear to be growing more polarised and less apt to talk to each other, rather than less. At the heart of the on-street misunderstandings is a paradox of road use that has struck me repeatedly over the years. It feels like a private experience to use a street - particularly when driving in a car. But one’s in fact engaged in a very complex social interaction. It’s vital to anticipate how others are going to act and that people broadly adhere to the expected ways of behaving, even if those are not the same as the formal rules of the road. In the US and UK, where cycling is a minority means of getting about, this creates a problem for people who ride bikes. Very few drivers or pedestrians can picture themselves in a cyclist’s place on the road or understand the multiple pressures on a cyclist on a busy road or mixed-use path or some other place where conflict between users arises. This only exacerbates, it seems to me, people’s tendency to stereotype cyclists’ behaviour. The wincing pedestrians at traffic lights are a case in point. While they perceive cyclists as inherently unlikely to obey traffic lights, I’m far more struck by how many cyclists obey signals whose placing and timing is generally governed by another mode’s needs. interaction it's surprising such scenes remain relatively rear. The challenges are all the greater because people have to make decisions on the roads fast. Many of my own reactions, I’m aware, come from bits of my brain that work so instinctively I’m barely aware of them. I’m startled into fear by the sudden movement of a car in my peripheral vision, much as my distant ancestors must have been hard-wired to jump at the movement in the corner of their eyes that signified a prowling bear or wolf. Once those fight-or-flight responses are aroused, I tend not to revert quickly to my normal polite, reasonable self. On top of all this, most people, I think, carry the mental scars of past bad experiences, which they recall far more readily than good things. It’s easy to miss how much that shapes one’s perceptions. A friend from New York, for example, cycled in London last summer and raved about how she saw no-one driving while using their mobile phone, comparing that favourably with New York. She had yet to build up my experience of spotting drivers using mobile phones in London. For me, by contrast, each time I see someone’s driving while using a mobile, it slots into a convenient mental envelope - “yet more evidence that dangerous mobile phone use is endemic among London drivers”. The net result of all these human foibles, it seems to me, is that nearly every road-user travels around a mess of prejudices, dangerous assumptions and hurt feelings. It’s hardly surprisingly, consequently, that myths about road user behaviour seem particularly persistent and prejudices against cyclists seem particularly hard to shift. People’s assumptions are shored up not only by what they see going on around them but by the far greater number of things they think they see going on. My apparent determination to plough down a busy pavement on a Monday morning probably did more to reinforce the prejudices of the Angry Man of Waterloo Bridge far more than any encounter with a real pavement cyclist would have done. Yet, however urgent the need to bridge this chasm of comprehension, the gap seems currently to be growing ever wider. Whereas debates about roads policy might once have been played out mainly through newspaper articles or in other media that had a range of contributors and readers, social media such as twitter seem to let narrow groups reinforce each other’s prejudices. Drivers’ twitter accounts often bristle with violent anger against cyclists, frequently reinforced by other, like-minded people. Cycling social and other media, meanwhile, are prone to a self-congratulatory tone and, sometimes, scorn for anyone using any other transport mode, including buses. I was particularly disappointed recently to read a column by Ashok Sinha, chief executive of the London Cycling Campaign, lambasting those of us who point to the evidence linking worsening motor traffic congestion with the building of London’s segregated Cycle Superhighways for spreading “fake news”. It would be far harder for this conviction to maintain its current hold on London’s cycling advocates if more of them spent time with transport planners and advocates from outside the activist community. Even planners who are well-disposed towards cycling and want to see cycling levels rise go slack-jawed in amazement at activists’ reluctance to accept the clear, substantial evidence that the new facilities have played a significant role in worsening congestion for motor vehicles. Yet I understand all too well why the echo chambers get sealed off from outside noises. Two of my Facebook friends would, for a while, respond every time I complained about dangerous drivers by complaining about the alleged danger posed by cyclists on pavements. When even a blogpost analysing the evidence on this point failed to persuade them, I took, I admit, the path of least resistance. I unfriended them, making my experience of Facebook less stressful but simultaneously less diverse. The problem is far from confined to cycling advocacy. This past week, I started a new, temporary day job as a political correspondent. It’s impossible to avoid the idea that politics in both the UK and US have grown polarised partly because people have so little experience of communicating with people with a different point of view. The stubborn insistence of some supporters of Jeremy Corbyn that he can lead the Labour Party to a general election victory makes far more sense if one imagine how information flows to Corbyn’s hardest-line supporters. Since most presumably have twitter feeds and Facebook timelines full of people agreeing with them, it must be easy to assume that the opinion polls - which show the party 20 percentage points or so behind the Conservatives - are some nefarious plot. The widespread nature of the problems, meanwhile, means I can’t offer an easy solution. I wanted to put the Angry Man of Waterloo Bridge straight but I couldn’t catch up with him. If the gulfs of understanding that separate multiple groups in contemporary society were easy to cross, misunderstanding would be far less rife than it currently is. The angry man’s reaction was, nevertheless, a useful reminder of how easy it is to slip into assuming the worst about another person and failing to question how one’s interpreting a situation. I will seek in future to be slower to anger, less ready to assume the worst about others and more ready to explain my own position politely and calmly.